Katronic have been working with clamp-on ultrasonic flow meters for twenty years. 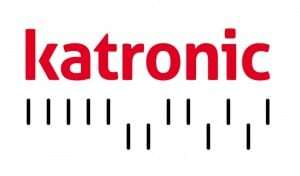 During this time Katronic have gained a vast amount of experience in specifying and supplying ultrasonic flow meters for a wide variety of different applications. In this Blog you will find answers to the most frequently asked questions about ultrasonic flow meters in general and Katronic flow meters in particular. Should you require any further information please contact Thorne & Derrick Sales Engineers – we can answer your questions, we can supply your requirements. HOW IS THE FLOW METER INSTALLED? As the ultrasonic sensors are simply clamped on the pipe surface, Katronic ultrasonic flow meters can be installed without the need to break into pipelines. 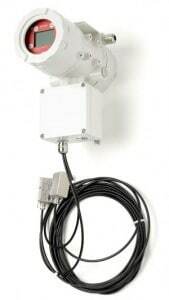 The sensors are fixed to the pipe using metal chains, straps or mounting rails. Additionally, coupling paste is applied to the bottom of the flow sensors to ensure an acoustically conductive connection to the pipe. While particularly rough or pitted pipe surfaces may need cleaning with a file or suitable abrasive material, Katronic flow sensors can usually be installed without the need for surface preparation. Every instrument of the Katronic KATflow series is equipped with a Setup Wizard and an Audible Sensor Positioning Assistant, which guide the user step-by-step through the installation process. As a result, it only takes minutes to install and set up the ultrasonic flow meter and to obtain correct measurement data. WHAT IS THE ACCURACY OF KATRONIC FLOW METERS? For volumetric flow measurements, Katronic’s KATflow flow meters can achieve an uncertainty of 1 to 3 % of the measured value depending on the specific flow measurement application. 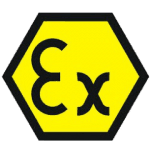 Uncertainty of approximately 0.5 % can be achieved with on-site process calibration. In case of flow velocity measurements, the flow meters achieve an uncertainty within 0.5% of the measured value. WHAT IS THE REQUIRED MAINTENANCE SCHEDULE FOR A FLOW METER? Katronic’s ultrasonic clamp-on flow meters do not contain moving parts which could wear out. The sensor casings are manufactured from stainless steel and are not in contact with the flowing medium, which helps avoid corrosion. Thus maintenance should not be necessary. 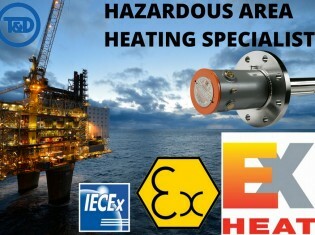 Are Flow Meters Suitable For Hazardous Areas? Katronic KATflow 170 is an ATEX certified flow meter for safe installation in Zone 1 & Zone 2 hazardous area locations and potentially explosive atmospheres – available in both aluminium and stainless steel for flow metering of hazardous area located pipework. WHAT IS THE EXPECTED BATTERY DURATION OF A PORTABLE METER? Both the KATflow 200 and KATflow 230 ultrasonic flowmeters operate for up to 24 hours in continuous operation on a full charge. The flow meters should fully charge in twelve hours – the operating time of a portable flow meter would decrease if the instrument is used intermittently. KATflow 230 is fitted with two 4-20 mA active outputs. If these are turned on battery life will decrease. The outputs should be disabled in the input/output menu if not in use. If an extended operation is required then the KATflow 210 should be used. The instrument has several battery configurations available and can be operated in three different measurement modes intended to provide the longest possible measurement. Present estimates indicate that in its largest capacity the KATflow 210 should be able to provide data logging for over three months. All of the Katronic flow meters can also be operated off mains power, providing continuous operation, even if only on a temporary basis. If either of the ultrasonic flow meters are failing to meet the expected battery performance please contact the factory for additional advice. WHY IS the FLOW METER NOT POWERING UP? Firstly, please ensure that the flow meters are fully charged – connect the flow meter to the charger. At this point the flow meter should power up and the battery indicator should be flashing to show that charging is in progress. If this does not happen please contact us. If the flow meter powers up on main supply turn off the flow meter, disconnect the power supply and attempt to turn on by pressing and holding the <ENTER> button. If the flow meter fails to turn on, open the battery compartment, remove the batteries, check their integrity and replace in the flow meter. Repeat the start sequence. If the flow meter screen still fails to illuminate the batteries may require replacement. Please contact the factory for more information. WHAT RANGE OF PIPE DIAMETERS CAN BE MEASURED? The KATflow series of ultrasonic clamp-on flow meters can cover a pipe diameter range from 10mm (0.4 inches) to 3m (118 inches) with special solutions available for non-standard applications. WHAT ARE THE STANDARD SENSOR CABLE LENGTHS? The ultrasonic clamp-on sensors of the KATflow series come with a standard cable length of 2.5 or 5.0 meters depending on the specific sensor type. Additional extension cables of up to 100 meters can be ordered separately. HOW DO I PROGRAM A NON-STANDARD MEDIUM? Firstly, the user can select “Water” from the menu. This might seem unhelpful but water has a good average set of values for the three main parameters that the flow meter needs. Using water for an application that was not water-based might not be perfect but could give the user a set-up that will allow the flow meter to measure. Please note that river-water, effluent, sewage etc. are all “water”, it is just the solid content that varies. It is unusual for users to know the C-speed of the medium, which is effectively the speed of conductivity of a liquid to ultrasound. There is a library of non-standard media in the back of the manual for this purpose. If the data is not found there, please contact Thorne & Derrick technical support for advice. Please note that any manually entered liquid information is only applicable at that temperature. IS CALIBRATION FOR SPECIFIC PIPES REQUIRED? Calibrations for specific pipes are not necessary. Entering the specific application parameters (e. g. pipe diameter, pipe material, type of fluid) into the flow meter ensures the above stated accuracy. If additional accuracy is required, a process calibration can be carried out on site. WHAT DO I LEARN FROM A FLOW METER CALIBRATION CERTIFICATE? Due to the ultrasonic measurement technology, there is no need to calibrate the flow meters to achieve the above stated accuracy (see question no. 2). If a customer requires calibration, this can be ordered for an additional charge. The certificate confirms that the supplied sensor and flow meter combination is delivering measurements which are in the accuracy range stated. DOES THE COUPLING PASTE NEED REPLACEMENT? Once applied to the sensors during the initial installation, the acoustic coupling paste should not have to be replaced. If the mounting point is exposed to extreme atmospheric conditions, we would recommend the coverage of the sensors to be checked once a year. WHY DO THE PT100 SENSORS SHOW > +800 °C? If a KATflow 100, KATflow 150, KATflow 170 or KATflow 230 is fitted with PT100 sensors we would expect the flow meter to provide reliable measurement of the pipe temperature. If however the flow meter is showing a fixed temperature of +800 ºC it means that the PT100 sensors are incorrectly connected to the flow meter, or are not connected at all. This temperature is the default error output of the flow meter. Please consult the manual for wiring instructions. WHY DOES THE FIXED UNIT NOT TURN ON? Firstly, ensure that power is reaching the main terminals on the flow meter using a multimeter. Check the fuses on the flow meter and replace if blown. Use the wiring diagram in the manual in order to ensure that the flow meter is wired correctly. Check that the correct type of voltage is being supplied to the flow meter. AC and DC meters are marked accordingly, if an incorrect power supply has been applied to the flow meter, please disconnect the instrument and contact technical support as damage may have been done to the electronics. WHAT IF I HAVE GOOD SIGNAL BUT NO FLOW? Before taking a measurement, the ultrasonic flow meter will guide you to the Audible Sensor Positioning Assistant. This tool will enable you to find the optimum location for the transducers. At this point it will give the user a graphical indication of signal strength, signal quality and a recommended sensor spacing. If this is correct, the user then moves to the measurement screen but what happens if in spite of good signal flow measurements are not obtained? Firstly a check should be made in order to ensure that there is indeed flow in the pipe at that moment. Experience has shown that many “issues” found when taking a measurement are application, rather than instrument based. The flow meter has three pre-set cut-off values outside of which measurement will not be possible under normal conditions. In the case of having what looks like a strong signal but no flow, it could be that the noise value is too high. In which case check the wiring of the transducers for any loose strands, and consider earthing the screens of the transducers. Alternatively make a note of the above values and contact Technical Support for assistance. WHY DOES THE FLOW METER SHOW LOW SIGNAL? Check that the pipe is fully flooded with liquid. If the pipe is empty or partially filled the flow meter is unlikely to display a good signal strength value. Ensure that sufficient coupling gel has been used when mounting the sensors. If air is between the sensor surface and that of the pipe, signal will be diminished. Verify that the surface of the pipe is in good condition. If the pipe is rusted, or covered in a flaking paint coat, then a file, wire brush, emery paper, or a grinder should be used to provide smooth surface on which the sensors can be installed. Check the orientation of the sensors. If the pipe is horizontal then the sensors should be mounted on the side of the pipe, never on the top or bottom. Please see the manual or the installation videos for more information (see question no. 1). Check the alignment of the sensors. They should be installed at the separation distance recommended in the Audible Sensor Positioning Assistant, and orientated with the arrows etched on the sensors aligned correctly. Verify the wiring of the sensors for fixed installation units in order to be sure that they are connected correctly. The manual provides guidance on this. Be sure that the liquid to be measured is suitable. If the solid or gaseous content of the liquid is too high, measurement will be difficult. If signal is low reduce the number of passes being used to the minimum of one in order to maximise the available signal. If all of this fails please contact Technical Support for more advice. WHAT SHOULD BE DONE IN ORDER TO MEASURE ON PAINTED PIPES? If the pipe is painted, and the coating looks in good condition, there is no need to remove the paint in order to get a good measurement. Paint should only be stripped from a pipe if it is flaking or in poor condition, where there is obviously multiple layers of paint, or where measurement has been attempted but poor signal is seen – see also question 14. WHY IS THE FLOW METER NOW SHOWING ZERO FLOW? Firstly verify that the liquid is still flowing and that the pipe is full. Check the sensor connections and that the sensors are still correctly mounted to the pipe. On the flow meter go to <System – Calibration – Zero – Track> and make sure that this is set to <OFF>. On the flow meter check the damping in <Output – Display – Damping>. If the flow is intermittent set the Damping to 5 s.
Check whether there has been a considerable change in temperature. If the flow meter is installed on a process where large variation in temperature is likely it might be worth considering using a PT 100 temperature input in order to help the flow meter compensate for this. 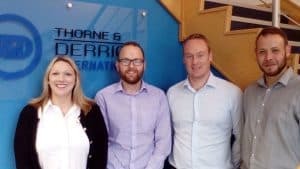 Pictured: T&D’s Metering Sales Engineers (Terry McDonald, Anthony Mitchinson and Adam Rowe) following a recent training day with Kirsty Hammond (Katronic Technical Sales Representative). 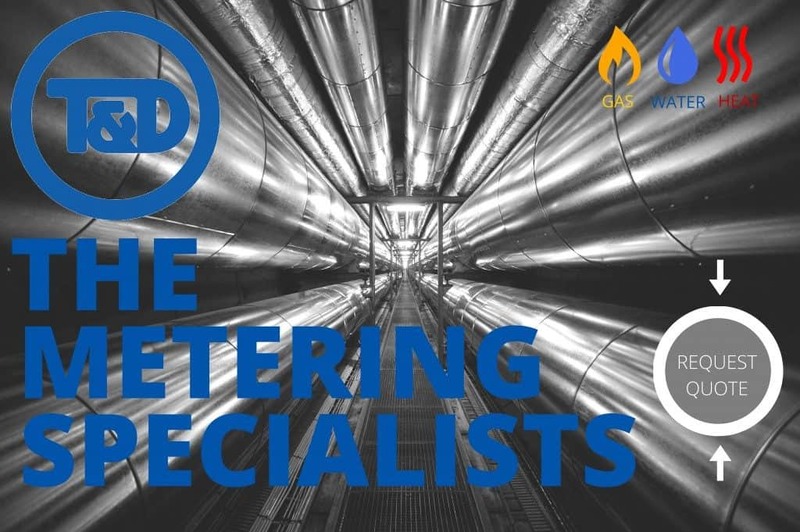 T&D are committed to growing product knowledge and expertise in order to support their customers in the optimum choice of meters, including ultrasonic flow type, for measurement applications. T&D: Distributor Of Water, Gas, Heat, Energy & Flow Meters – contact us for competitive prices, delivery and technical support. 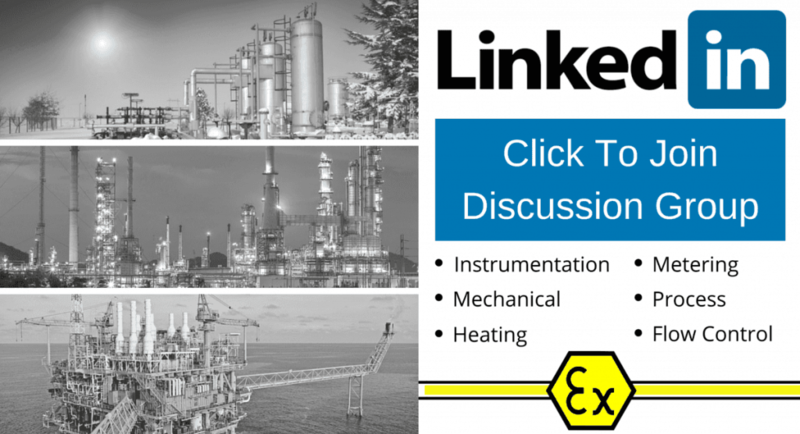 Thorne & Derrick are inviting you to join LinkedIn’s fastest growing Discussion Group – Process & Hazardous Area Industries : Heat Tracing, Gas Detection, Fluid Control & Flow Measurement. News, projects, videos, promotions, whitepapers, jobs, webinars, press plus much more. Thorne & Derrick International are your single-source supplier of Electrical, Mechanical, Process & Instrumentation Equipment. T&D provide an outstanding service to UK and international customers – we are highly customer responsive and absolutely committed to providing a world-class service. T&D supply utilities, power, renewable energy, construction, rail, manufacturing, food/beverage, mining, oil, gas and petrochemical industries – distributing 100,000+ products from 100+ manufacturers from multi-million pound stocks. Since 1985 we have established a solid reputation based on service, integrity and trust.